Daniel Everett was a missionary who was ready to devote his life to the Pirahãs, a small tribe of the Amazonian Indians in central Brazil. He moved all the way (including his wife and two young kids) to the Amazon jungle to learn their unique language and culture, aim to translate the Bible and convert them eventually. But as he joked - “I am a happy failure” - after decades of hard work, he was only able to “convert” one person - himself - from a Christian to atheist. I read the most of the book this April in Karuizawa when I was carrying on my Writing Spree activity. Really enjoyed it, it was like I was in the Amazon jungle and experienced an extrordinary life myself. The Pirahã people usually only posses one gym short pants, not even a permanent houses of their own, yet they’re the happiest people in the world according to an MIT study. Take a simple look and see how often they laugh and smile a day, it easily beat any other societies or countries in the world. He once asked the Pirahãs if they knew why he was there in his early days. In the book it mentioned that there were other tribes in the same area were much fond of the Western goods and culture that they adapted to it and eventually lost their own languages. This is not the case for Pirahã. There is a hidden beauty in their seemingly simple yet sophisticated lifestyle, like a diamond in the mud. 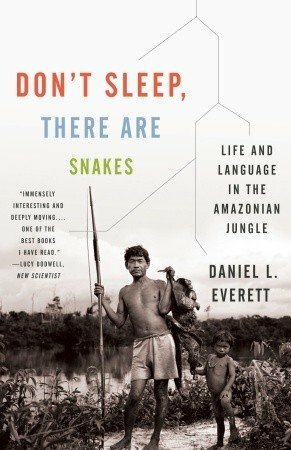 What drew my attention first was how the author performed his linguistic field research and was able to uncover the uniqueness of the Pirahã language and culture. No police, courts, chiefs, or other kinds of authority figures. They are mostly by tradition egalitarian, free of the influence of any leaders. “Don’t tell us what to do, how to live,” is the norm. No concept of a supreme spirit or god. They do not talk about unexperienced events, such as long past or far future events, or fictional topics. So there are no oral history or myth about where they are from or who “created” them. Pirahãs don’t store food, they don’t plan more than one day at a time, they don’t talk about the distant future or the distant past - they seem to focus on now, on their immediate experience. There is no word for “great-grandparents” as they can’t live long enough to “witness” their grandparents. And since they don’t talk about long past events or figures, there is no word in the language to refer to that ancestor. The value seemed to be to limit most talk to what you had seen or heard from an eyewitness. To elaborate that, it means the Pirahãs believe only what they see. Sometimes they also believe in things that someone else has told them, so long as that person has personally witnessed what he or she is reporting. The grammar is also accustomed to that culture. For example, when they say “John went finishing [suffix],” there could be 16 suffixes to the verb and 3 suffixes are the most important ones to indicate the source of the evidence. a) John went finishing, and I saw it. b) John went finishing, and I heard about it. b) John went finishing, and I deduced from the local evidence. This may sound absurd at first, but let’s think about it, this probably is why they don’t need a leader because everyone is responsible for himself/herself, including little children - “little” as in our views. There is no baby talk. They believe all members of the society are equal and thus “children” should not be treated any differently from adults. Everyone has responsibility for the community and everyone is cared for by the community. That means a 4-year old would work their shares to contribute, and could also share alcohol with adults. A language is a repository of specialized cultural experiences. When a language is lost, we lose the knowledge of that language’s words and grammar. Such knowledge can never be recovered if the language has not been studied or recorded. Not all of this knowledge is of immediate practical benefit, of course, but all of it is vital in teaching us different ways of thinking about life, of approaching our day-to-day existence on planet Earth. Every language and culture pair shows us something unique about the way that one subset of our species has evolved to deal with the world around it. Each people solves linguistic, psychological, social, and cultural problems in different ways. When a language dies without documentation, we lose a piece of the puzzle of the origin of human language. But perhaps more important, humanity loses an example of how to live, of how to survive in the world around us. The way that Pirahãs are living, some of their views and cultures may seem very counter-intuitive, however, they provide us a version of how we, our species, could live differently. A running example. It becomes even more precious when a good amount of our world emphasize more and more on a narrowed view of chasing next big wave, outrunning your opponents, and ever-expanding but never satisfying. Whose version is more primitive or sophisticated? Find out more in the book.